Abstract: Objectives: To determine the ability of adoptively transferred MHC class II mismatched CD4(+) T-cells to induce a tumor specific antibody response in a murine model of melanoma. To correlate the level of antibody with reduced tumor burden. Methods: To establish a murine model of melanoma, 0.5x105 C57BL/6-derived B16 melanoma cells expressing OVA were injected via the tail vein into wild-type C57BL/6 mice. 24h later mice were injected with either 4x106 or 5x105 MHC class II mismatched CD4(+) T-cells from the bm12 mice. The bm12 mice are C57BL/6 that harbor a mutation in the H2-Ab1bm12 allele resulting in a variant MCH class II allele. CD4 T cells were separated from mouse spleens using MACS separation with positive selection (Miltenyi). Controls included no injection and autologous cell transfer. Two independent experiments were conducted consisting of either 5 or 10 mice per each control or treatment arm. Mice were sacrificed on either day 10 or day 20 post cell transfer and the effect on tumor burden was measured by counting pulmonary metastasis. Serum antibody responses were measured using an indirect ELISA specific for OVA (Chondrex Kit #3011). Germinal centers in the spleen were counted using immunohistochemistry with fluorescently labeled antibodies to GL7, a germinal center marker and B220, a B-cell marker. Results: Two independent experiments showed statistically significant reduction of pulmonary metastasis compared to control (n=10, mean met count; 14.6 vs. 32.2, p=0.02) and (n=20, mean met count; 13.5 vs. 28.8, p=0.01) at day 10 post adoptive cell transfer of either 4x106 or 5x105 cells. There was also statistically significant reduction of pulmonary metastasis compared to autologous cell transfer control (n=20, mean met count; 13.5 vs. 27.9, p=0.008) when 5x105 cells were used. 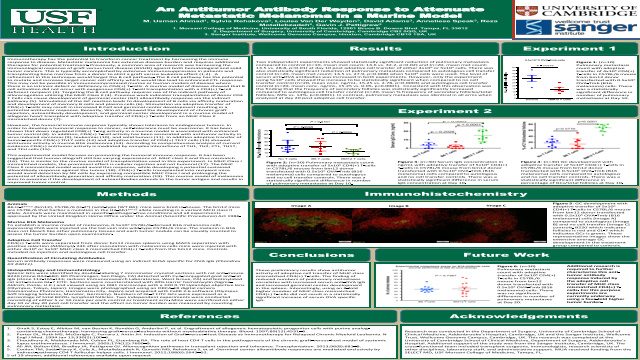 The level of serum anti-OVA antibodies was increased in both experiments. However, only the experiment using 5x105 cells showed the increase to be statistically significant when compared to no cell transfer control (n=20, mean conc. ng/mL, 15.25 vs. 2.78, p=0.0003) and autologous cell transfer control (n=20, mean conc. ng/mL, 15.25 vs. 0.05, p<0.0001). Consistent with this observation was the finding that the frequency of secondary follicles was statistically significantly increased compared to autologous cell transfer control (n=20, mean % frequency of secondary follicles/total follicles; 69% vs. 14%, p<0.0001). In contrast, pulmonary metastasis was identical in all arms when analyzed at day 20 post adoptive cell transfer. Conclusions: These preliminary results show antitumor activity of adoptive cell transfer of MHC class mismatched CD4(+) T-cells. The finding of reduced numbers of pulmonary metastases correlates with increased serum anti-OVA IgG and increased germinal center development in the spleen. Interestingly, using an 8-fold higher number of MHC class mismatched CD4(+) T-cells did not result in a statistically significant increase of serum OVA specific IgG. Additional research is required to further characterize this anti-tumor antibody response induced by the adoptive cell transfer of MHC class mismatched CD4(+) T-cells. For this purpose experiments are currently underway using a four-fold higher tumor burden.Summary: A mouse model of melanoma was used to determine the ability of MHC class II mismatched CD4(+) cell to induce an anti-tumor antibody response. Ovalbumin (OVA) positive B16 melanoma was injected into C57BL/6 mice. Adoptive cell transfer of CD4(+) T-cell from the bm12 mouse was used as treatment. Pulmonary metastasis, level of OVA antibodies and GC development in spleen were compared to controls. Preliminary results indicate that a single adoptive cell transfer delays metastasis.References: 1. Giralt S, Estey E, Albitar M, van Besien K, Rondón G, Anderlini P, et al. Engraftment of allogeneic hematopoietic progenitor cells with purine analog-containing chemotherapy: harnessing graft-versus-leukemia without myeloablative therapy. Blood. 1997;89(12):4531–6. 2. Porter DL, Roth MS, McGarigle C, Ferrara J, Antin JH. Induction of Graft-versus-Host Disease as Immunotherapy for Relapsed Chronic Myeloid Leukemia. N Engl J Med. 1994 Jan 13;330(2):100–6. 3. Choudhury A, Maldonado MA, Cohen PL, Eisenberg RA. The role of host CD4 T cells in the pathogenesis of the chronic graft-versus-host model of systemic lupus erythematosus. J Immunol. 2005;174(12):7600–9. 4. Ali JM, Bolton EM, Bradley JA, Pettigrew GJ. Allorecognition pathways in transplant rejection and tolerance. Transplantation. 2013;96(8):681–8.